THE Employment Relations Tribunal has ordered the return of all Air Terminal Services workers who were locked out by Management from December 16, 2017. The Resident Magistrate Hon Mr Andrew See also ordered that all pay and entitlements from December 16, 2017 be restored. The ruling states that ATS must give effect to the order by issuing to all such employees new work rosters, security access ID cards and any other pre start‑work requirements within 48 hours hereof. The order also says ATS must thereafter and on a case by case basis ensure that the pay and entitlement of each employee are reviewed and where necessary re instituted in accordance with the law. It also says that the respondent Association and its members comply with the terms of the master agreement in order to secure and preserve amity and good relations between the company, association, and the employees and to resolve any difference of opinion or dispute between the parties. Federated Airlines Staff Association General Secretary Vilikesa Naulumatua says they look forward to the court’s ruling being implenteted and everyone returning to work. Fiji Trades Union Congress National Secretary Felix Anthony says the workers were prepared to return to work from the 16th of last month. MORE than 200 Air Terminal Services (Fiji) Ltd workers camped outside their Nadi headquarters for the past 31 days could return to work soon. This after the Employment Relations Tribunal managed to get the two parties to agree that the most pressing issue was the return to work of employees at the earliest possible time. The tribunal convened a meeting yesterday at the Nadi Magistrates Court after ATS management filed an application for the tribunal to clarify the definition of illegal strike, among other issues. Resident magistrate Andrew See said other issues of concern could be addressed once all 220 employees returned to work. During the proceedings, Mr See said he was well aware of the ATS saga and warned that actions of both parties over the past 31 days had not been “completely exemplary”. He said the workers’ actions in walking off the job suggested that prima facie unlawful industrial action had been taken, but management made the situation worse by suspending workers without pay for 31 days without following established procedures for such actions. The workers, represented by the Federated Airlines Staff Association, were represented by Kevueli Tunidau, while Noel Tofiga appeared on behalf of the ATS management. Mr See said there were two main areas of concern: firstly whether the act of workers abandoning their posts could be viewed as misconduct; and secondly whether the company had acted lawfully when it suspended workers without pay for the past 31 days. Mr See questioned Mr Tofiga on the legal basis and authority the company had acted upon to suspend and not pay workers without forming a disciplinary committee to address the issue first as set out in the ATS-FASA agreement. “Ultimately, you have to look at the individual circumstances because otherwise it would not be completely fair to each individual,” said Mr See. He said the most important issue to address was “to reconcile issues and get workers back at work as soon as possible” rather than spending a lot of time and effort in arguing whether the action taken by the workers could be defined as a strike or not. Mr See urged both parties to resolve their issues with urgency because each day that was spent in debate and discussion meant one more day without work for ATS employees. Mr Tunidau and Mr Tofiga informed Mr See that the only holdup in negotiations between the two parties had been the contents of a letter proposed by management for workers to sign. Mr Tunidau informed the tribunal that the letters were incriminating and workers would not sign letters for something they were not guilty of. Mr Tunidau had asked for seven days, but Mr See said he would rather the issue be resolved sooner than later. In response both lawyers informed the tribunal that a new letter would be drawn up by Saturday, which could open the doors for the employees to return to work. FASA and ATS management have also made verbal commitments to pave the way for employees and management to resolve issues, and agreement was reached for negotiations on internal issues to be resolved through established processes. The two parties will meet on Saturday during a special sitting of the Employment Relations Tribunal at the Nadi Magistrates Court at 10am. The ITF has today written to Fiji Consulate General in Sydney, Mr Zarak Khan to lobby for the Fijian Government to take action to end the crisis in Fiji. Below is the text of the letter. I am writing to you as the President of the International Transport Workers’ Federation (ITF). The ITF is a global union federation, which represents around 700 labour unions and represent 19.7 transport workers around the world. The ITF has a long history of promoting the employment and welfare of transport workers around the world. The ITF has concerns regarding the situation of the 220 Air Terminal Services (ATS) workers at Nadi International Airport, who have been locked out since December 16, 2017. These workers were locked out by the management of the majority government-owned ATS after attending an emergency shareholders’ meeting over alleged mismanagement and appalling conditions – including sexual harassment and an 11-year pay freeze. The ITF is alarmed about reports that experienced ground crew have been replaced by workers who lack sufficient experience. This has put safety standards at significant risk. Reports have emerged that “temporary” staff failed to report damage sustained to an Air New Zealand aircraft on the tarmac in Nadi. The airline only became aware of the damage when engineers inspected the jet on its return to Auckland. Tourism is of course a major enterprise in Fiji, and for the industry to be successful travellers must be confident that their safety and security is assured. Today, the ITF and affiliated unions, alongside the Australian Council of Trade Unions, request that you urgently communicate to the Government of Fiji our appeal that government ministers move swiftly to ensure the workers can immediately return to work. agree to a timeline to resolve all other issues, in particular the workers’ cost of living adjustments. It is within the Government of Fiji’s powers, and within the law, to resolve this issue. We are also asking the Australian Government to use its influence to urge the Government of Fiji to resolve this dispute promptly. I would like the opportunity to meet with you to discuss our concerns and to facilitate a successful outcome to this dispute. Please contact Luke Menzies via phone on 0433 889 844 or email at menzies_luke@itf.org.uk to organise a meeting. The International Transport Federation today called upon Fiji Government to act immediately to end the crisis. ITF has 16,500,000 members from 694 affiliated unions in 149 countries. 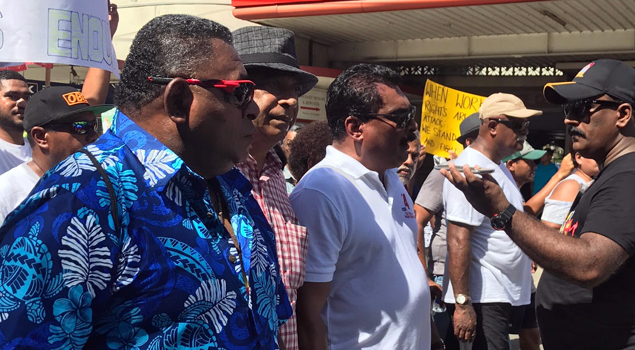 Australian union activists will protest in Sydney today in support of 220 Fijian aviation ground handlers who have been locked out of their workplace at Nadi International Airport by employer Air Terminal Services (ATS) since December 16, 2017. The rally, organized by the International Transport Workers’ Federation (ITF), will call on the Fijian Government – a 51 percent shareholder in ATS – to take urgent action to end the lockout and allow workers to return to work. ITF President Paddy Crumlin today urged the Fijian Government to act: “For over a month, 220 workers have been locked out, simply for defending basic workers’ rights. The workers – baggage handlers, check-in staff, engineers and caterers – were targeted after attending a recent meeting where issues of mismanagement and appalling conditions were discussed, including an 11-year pay freeze. A letter by Paddy Crumlin to the Fijian Consulate in Sydney will be delivered at the rally. “The ITF is alarmed about reports that experienced ground crew have been replaced by workers who lack sufficient experience,” the letter says. “This has put safety standards at significant risk. Reports have emerged that “temporary” staff failed to report damage sustained to an Air New Zealand aircraft on the tarmac in Nadi. “The airline only became aware of the damage when engineers inspected the jet on its return to Auckland. “Tourism is of course a major enterprise in Fiji, and for the industry to be successful travelers must be confident that their safety and security is assured. *agree to a timeline to resolve all other issues, in particular the workers’ cost of living adjustments. “The government must act to end this crisis and ensure that safety concerns don’t cause travelers to think twice about visiting Fiji,” Mr Crumlin said. Amnesty International says ATS workers plight must be heard! INTERNATIONAL human rights body Amnesty International (AI) says the plight of Air Terminal Services (Fiji) Ltd (ATS) workers must be heard. AI Pacific researcher Kate Schuetze said Fijian authorities must not hinder or obstruct workers, human rights organisations and others from participating in peaceful protests for fair and just working conditions. “Fiji ATS airport workers have the right to freedom of expression as enshrined in Fiji’s Constitution,” Ms Schuetze said. She said the constitutional rights extended to their right to strike and peacefully protest to demand fair wages or improved working conditions without fear of reprisals. Ms Schuetze claimed AI was told of alleged police searches on buses and cars travelling to Nadi for the march last Saturday. She said such an act by the police was an arbitrary and disproportionate restriction on freedom of movement. Ms Schuetze said they were closely following the developments surrounding the dispute. Police spokesperson Ana Naisoro said police would not make any comments on the issue. These were the words of FTUC General Secretary Felix Anthony who has reiterated that the march today in Nadi is in support of the ATS workers who are locked out. He has also stated that the Prime Minister would do well to address the real issue and resolve the dispute then politicize the issues as the Unions have always been prepared to talk and negotiate. Anthony says that the government can expect more from the ATS workers and the Unions of this country if it does not change its decision on the dispute adding that they are also considering further action such as international campaign if the dispute is not resolved soon. On Saturday January 13th, thousands of workers, affiliate unions of the FTUC, members of the public , NGOs, political party representatives and members and families of the ATS workers joined the march. The march ended with a rally with the Nadi District School. A photo gallery will be uploaded soon. The FTUC is not surprised by the remarks attributed to the Prime Minister regarding the lockout of ATS workers. As usual, he plays the blame game on politicians and trade unionists for this unfortunate dispute but says absolutely nothing about the real issues that gave rise to this situation. He conveniently forgets that he himself is a politician and forgets to understand that as Prime Minister, his comments need to be responsible and considered. The Federated Airline Staff Association (FASA) is an affiliate of FTUC and as such has sought the assistance and advice of FTUC. As National Secretary, I am duty bound to assist. The Prime Minister must also understand how trade union work. Their very existence is founded on workers solidarity. It is for that reason all trade unions support the workers. In a true democracy, the citizens, political parties, Religious Organizations and NGO’s are free to air their support for any cause that they stand for. Workers’ rights cuts across all rights and is part of human rights. It is therefore proper and responsible for all to speak out against any injustice. The Prime Minister would do well to understand better how true democracy works. The Prime Minister talks about labour laws but fails to understand how the law works. Further, he blames the Union for the walkout when everyone in the country knows, including Management of ATS that the meeting was called by and conducted by ATSET, the 49% shareholder of the Company. Clearly the PM is either mis-informed or simply does not have his facts correct. It is ironic that the Prime Minister should call on workers to sign a document admitting they did wrong in attending the shareholders meeting when he himself to date has not admitted, let alone in writing that it was wrong and illegal to overthrow an elected government. The workers are not going to implicate themselves just to serve the ego of Riaz Kaiyum and his elder brother Saiyad Kaiyum, who the Prime Minister obviously supports. Personal attacks on the salaries of trade unionists is not going to help when the entire country knows the exorbitant salary, allowances and other perks that the Prime Minister himself enjoys greatly while globe-trotting or trotting around the country campaigning on taxpayers’ funds. It is time for the Prime Minister to look into the mirror first. We also note that the Prime Minister and others who support Management shed crocodile tears for workers at ATS for not being paid last pay day to support their families. This brings to the fore, why aren’t the same people crying for the thousands that are unemployed or underemployed in this country or for those who earn NEC wages at $60.00 a week or those on Minimum wage of $2.68. How do these people survive for their entire working lives? I do not see the same people shedding tears for them including the Prime Minister and his Government. We call on the Prime Minister to educate himself on the real issues that gave rise to the Workers Trust calling an emergency meeting and also the long list of grievances that workers have had going back eleven (11) years. He needs to understand that workers need a decent living which they are entitled to and dignity at work. As 49% shareholders, they need to be consulted and represented on the Board of ATS which they have been denied of late by his own Government. They are equally concerned about the mismanagement that has prevailed in the company which ultimately will affect their interest in the Company. They, therefore have every right to raise their concerns as shareholders. Let me finally assure the Prime Minister that FTUC has nothing to gain from this dispute, but workers at ATS do and they need assistance of FTUC. FTUC will stand by these workers and do whatever is necessary. RECALLS: That ATS (Fiji) Limited was formed with the initiative of ATS staff of the company who were members of the Federated Airline Staff Association (FASA) and under the umbrella of the Air Terminal Services Employees’ Trust in 1981 at Nadi Airport. SUPPORTS: The principles of industrial democracy and worker participation in the decision-making process and equity holding within enterprises as was practiced at ATS and which were at one time the hall marks of peace, harmony and stability for workers. NOTES: With shock and utter dismay the reports of financial mismanagement within the company and serious concerns raised by the Employees’ Trust who are 49% shareholders and who have been penalized by the recent lockout for holding an emergency shareholders meeting and for questioning the accountability and transparency in the management of its assets and resources. CONDEMNS: The actions of the Chairman of the ATS Board and its Acting CEO with the overt support of the government for locking out members of FASA and ATSET on 16th December, 2017 who attended the Employees’ Trust meeting. We call for the immediate sacking of the two perpetrators so that workers can return to their jobs. The delay in settlement is due to the arrogance of ATS Chairman Riyaz Khaiyum who is blocking progress to any speedy solution, since he is the one bent on seeking apologies from the FASA members so that he is able to bask in his inflated ego. CALLS ON: The ATS Board Chairman and the government appointed Board of Directors, and the Minister for Public Enterprises, as the line Minister in this case, who is also the brother of the Board Chairman Riyaz Khaiyum relating to their fiduciary duties and responsibilities under the relevant legislations and calls on each of them to wake up from their deep slumber and to resolve the injustices perpetrated against the FASA members, rather than blindly pre-occupying themselves with massaging the giant size ego of the ATS Chairman. EXHORTS: The Minister for Employment, Productivity and Industrial Relations to resign from his portfolio immediately for failing to apply fairly and without bias relevant rules, procedures, regulations truthfully under the ERA and as a result of this FASA members are without job for the past fifteen days during this festive season. This is the Minister who declares the Lockout as illegal strike and then calls on his mediation service staff to mediate in his own created mess and purports to find a solution to the dispute. Either the Minister has a total lack of knowledge on ERA or he has been directed to weaken FASA as a Union and ATSET members as 49% shareholders so that ATS Chairman and his cohorts are able to sell the workers share for profiteering by a private company who has been eying for a lucrative enterprise in order to add to their growing portfolios. EXPRESSES: Its profound anger and apprehension that ATS Chairman and the Acting CEO have resorted to union busting tactics to cover up their inefficiency, indifference, biased practices and continued to look away from the sheer lethargy of the Management, as such the financial mismanagement, industrial disharmony, discord and denial of rights and dignity of workers resulting in chaos since Riyaz Khaiyum was appointed as the Chairman of ATS by his Minister brother. REITERATES: That workers have rights to work with dignity, justice and without any fear or oppression which is enshrined in the 2013 Constitution, the Universal Declaration of Human Rights and the ILO Conventions 87 and 98. REMINDS: The regulatory authorities such as CAAF and AFL to investigate the breaches of safety standards which has been happening on a daily basis from 16th December 2017. CAAF as a regulator has not only turned a blind eye to the safety breaches but has covertly supported the ATS management to prolong the lockout. Since the AFL security staff and others have been deployed to assist in baggage handling which has left the Airside unattended that allowed the members of the public to roam around the restricted areas of Nadi Airport. Photographs are available for those interested to see the evidence. WARNS: The Minster for Employment, Productivity and Industrial Relations to refrain from siding and supporting the ATS Board Chairman for his own political survival as the FTUC along with its affiliates will take all necessary action at any cost to defend and protect the rights of FASA members. Take all legitimate steps, use all resources, including industrial action and solidarity support including a National Strike, should the impasse continue and a protest March on Saturday 13th of January, 2018 in support of workers locked out. Pledge full support to fight injustice inflicted on FASA members. Seek the assistance of Global Union Federations and international solidarity organizations. CONDEMNING: The government for its continued anti-labour stance in its support to further deprive workers of their rights and it must now immediately order the ATS management to desist from recruiting temporary staff as it is in total breach of the ATS/FASA Master Collective Agreement. REQUESTS: The relevant Government Ministers in charge to deal swiftly, with the plight of FASA members so that they can immediately return to work with dignity and punish those responsible for creating the total mismanagement of assets and resources and also to those engaged in behind the scenes activities to illegally sell the workers 49% shareholding. LOOKS FORWARD: To continued success and progress of ATS (Fiji) Ltd so that its employees’ who are also shareholders serve the company, the nation and the vast travelling public with the same vigour and dedication as performed in the past, and be an exemplary model and motivation for other workers. International solidarity action has in process now and here’s the link to support the locked out workers at the ATS. 1. Sign the campaign – you will receive an email to confirm that you have done so. 2. Share on your facebook link via the Fiji Trades Union Congress facebook page. 3. Email this email to your network, friends, families and members. Your attention and action to this request is highly appreciated. This is a global campaign and you may share and inform your international counterparts as well. FTUC NS speaks with locked out workers of ATS at their picket site in Nadi. As day 5 of the lockout continues, support from local and international organizations and well-wishers continue to pour in at the picket site. Members of the general public are also showing their support to the cause and bringing food and refreshments for the employees at the picket site. As shareholders of 49 percent of the company, the workers, who are also members of the Federated Airline Staff Association (FASA) attended a beneficiaries meeting at Waimalika, Nadi, on Saturday (16/12/17) regarding serious breaches and ongoing issues with Management. The FTUC is supporting its Affiliate, FASA, in its negotiations with the ATS Board & Management in response to the lockout initiated by the Employer.